I don’t see the instructions. Am I missing something? Hi Nancy. It says above to click on the link for the original tutorial. Posts located in the “inspiration file” are others’ posts that I store away for myself (and share with all of you). I’m so glad you commented on this post because I had forgotten all about it and would love to do this in my hallway :). Blessings! This is such a wonderful idea… if only my ceilings were high enough to pull it off! And boobie lights, hahaha, I thought we were the only ones to call them that… they’re ALL over the rental we’re currently in, sigh. WOW! I have never seen that before! You are very crafty! 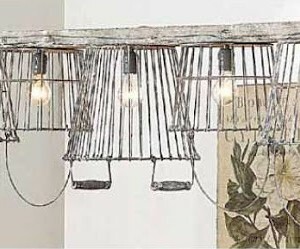 Love it…but I have to say I was with you…bought and wired a birdcage as a hanging fixture back in 2009 as well! Yeah Beth…trend setting and predicting. Look out Anna Wintour! LOL! HAHAHAH the boobie light…we have one of those too….but we ALSO have those uber ugly brass default chandeliers in our dining room…its on its last leg right now….one more bulb to blow out. Because I refuse to buy anymore. and when that last one goes…its time for a new chandelier….I really like this idea….and i might just do this in a bronze!!! !